President Trump hasn't been shy to criticize the NFL recently. But according to one team owner, there's something personal at the core of this feud. 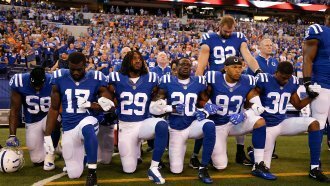 President Donald Trump has been hammering away at the National Football League recently over the players' national anthem protests. One NFL owner thinks Trump might have a more personal ax to grind. In an interview with USA Today, Jacksonville Jaguars owner Shad Khan called the president's sparring with the NFL a "personal issue" tied to the fact that "a great goal he had in life to own an NFL team is not very likely." It's true that Trump has tried to buy an NFL team before. He was one of the contenders when the Buffalo Bills went up for sale in 2014 but wound up losing a bidding war. But Trump's fascination with pro football goes back further than that — and beyond the NFL. In 1983, Trump bought a team in the United States Football League. At the time, it was a spring league aiming to rival the NFL. "Last year it started off reasonably strong; this year it's gonna stay strong," Trump said in the interview. "You're going to see a very big week next week; you're going to see a huge week the following week. It's going to stay strong; it's going to stay strong for a long time." But Trump soon started to push for changes in the league, like moving the USFL season to the fall to go head-to-head with the NFL. He also spearheaded a lawsuit accusing the NFL of monopolizing Sunday football revenue. "I think we have an excellent lawsuit; we have a case of a complete monopoly by the NFL, and we expect to be successful in court." Trump said on CNN. "We are not doing this for any other reason." Trump's optimism in front of CNN cameras wouldn't last. Though the NFL was technically found guilty on one charge, the USFL only received $3 in damages and folded soon after. "What we're trying to do is stay out of politics. We're not looking to get into politics. What we're looking to do is continue to get people focused on football," Goodell said.